Can You Believe the Deals Are This Good? The throngs are pouring into River City Books’ bargain books area where they are frolicking about the tables and shelves gobbling up great gifts and saving money that can be spent on extra holiday cookies. They are picking up great books for the cost of a frappe-a-chocolate-half-caf-a-chino or whatever it is the kids are ordering at the coffee shop these days. 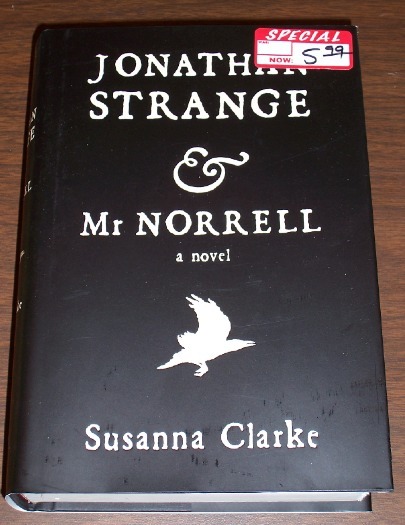 Here, for example, is one bargain that made my eyes pop out of my little skull: Jonathan Strange and Mr. Norrell by Susanna Clarke. This highly acclaimed book, which retails at $27.95, is now on sale for $5.99. While supplies last. This entry was posted on November 27, 2007 at 5:38 pm and is filed under Bargains. You can subscribe via RSS 2.0 feed to this post's comments. You can comment below, or link to this permanent URL from your own site.